I’ll need to be brief this week as I’m scheduled to fly to the USA tomorrow and haven’t started packing yet. 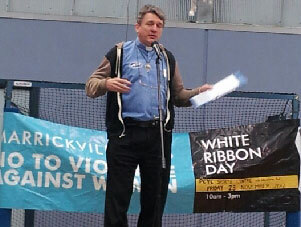 I want to say a big ‘thank you’ to the organisers of this year’s White Ribbon Day for inviting me to speak. As a representative of both the church and the boxing community I thought I was an odd choice, as both are thoroughly patriarchal institutions that have a rather poor record with regards to the rights of women and violence respectively! Even so, it was a great privilege! REAL MEN DO NOT HIT WOMEN! You can read the written version of my address here if you’re keen. I’m even more sorry that I didn’t get a video-recording of my speech given at this rally, as the whole event was very intense and highly charged! 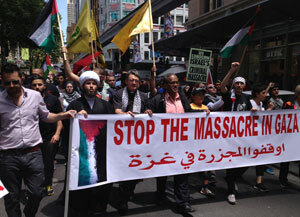 You pick up something of that atmosphere in the Press TV report (which you can see here). You can read the transcript of my address here. I don’t know how many thousands were at the rally but it was an amazing turnout when you consider that a ceasefire was already in place by the time we marched. You might have thought that everyone would think that the crisis was over and stay home. Not so! Most people seemed to realise that even though a ‘ceasefire’ is in place, the violence has not really stopped and will not stop until the occupation of Gaza is ended! The State of Israel still controls all land, sea and airspace around Gaza and controls very strictly what sorts of goods and people are let in and out. In the name of preventing bomb-building materials from entering the city, all sorts of medical supplies and building materials are kept from the people of Gaza, and the densely-crowded population have to deal with enormous health and sanitation problems on a daily basis. It’s like a massive open-air prison, except that the warders all remain on the outside of the prison walls! So the bombs and rocket-fire have stopped, but the captivity of Gaza has not stopped, which means, in a sense, that the violence continues. If I might use an analogy from the world of pugilism, it’s as if you have two fighters, where a heavyweight has a lightweight in a headlock and is choking him. Every now and then the guy being choked starts biting at the big guy’s arm, to which the big guy responds by punching his captive in the face. A ‘ceasefire‘ in this context is where the punching and biting stops, but the violence hasn’t stopped because the little guy is still being choked, and the biting and the punching are bound to start up again soon if the big guy doesn’t ease up on the headlock! OK, it’s a crude analogy, but that’s how I see it. Before I move on from the rally, let me say what a privilege it was once again to speak alongside my mate, Antony Loewenstein. There are few people in this struggle that I admire more than Antony. 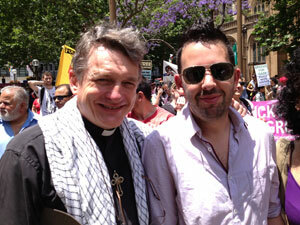 As a Jewish Australian committed to justice and peace, Antony is under constant attacks from both sides. There is genuine racist anti-Semitism in this country that feeds parasitically off the Palestinian cause, and Antony gets targeted by that. Conversely, he gets slander and death threats from people who see him as a traitor and ‘self-hating Jew’. Despite all this Antony continues to stand on his convictions and speak the truth as he perceives it. Even though he’s not a religious man, I’m sure he won’t mind if you say a prayer for him! I didn’t give the sermon yesterday. It was Fighting Father Keith! Now, I’m not blaming Keith in order to avoid controversy myself (AS IF ). I think what Keith said was great! I just can’t take any credit for it. The sermon was the first in a two-part series, and we’re going to publish the video-recording of part one very soon, but for the moment only the written version is available (click here). I’ve asked Keith to field questions that come in on the blog, so feel free to leave your comments and questions there. Be warned though that any comments that are really nothing but personal attacks will not be published. Now … the good news is that while there was no live video-cast of the sermon last week (due to technical problems at church.tv) this week their servers should be up and running again, which means that we should be able to bring you the sermon live on Sunday morning if you’re free! Sadly, I won’t be free to tune in at all as I’ll be working the corner at the main event in West Virginia at about the same time that we’re starting Sunday morning worship in Sydney. Even so, for those who won’t be at the fight, tune in to church.tv at 9.15am (Sydney time) next Sunday to catch part 2 of this sermon series. God willing, I leave for the US tomorrow and will be there for just over a week. My itinerary is looking pretty full now. I hope to meet up with a new member of the Order (Fighting Father Ricardo) in LA before heading to the East Coast. I’ll then hopefully catch up with friends and battlefields in Gettysburg before heading to the fight venue in West Virginia. The fight is the reason I’m there of course and I hope to be of genuine service to our boy, Sol Egberime. Despite being the underdog in this event, I know that he will put on a great performance and I look forward to telling you all about it in my missive next Monday. 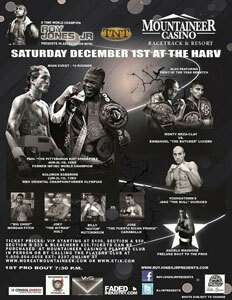 I’m also looking forward to meeting Paul Spadafora and his team after the fight. I hope I’ll get a chance to meet up with Roy Jones Jr too, as he’s promoting the event. From West Virginia I’ll be doing about 10 hours driving further West to meet up with Fighting Father Rob Burgess and my old friend Father Iovane of the Community of St John – both now based near Chicago. I’ll start to bore you if I go into any more detail but it’s all very exciting for me of course. OK. I’d better go and start packing! Say a prayer for me!